Highlights of this special evening include Mico Rodriguez of “Mi Cocina” fame sharing his fascinating tale of success and struggle in the Tex Mex biz, a Dallas Observer writer’s play-by-play at a recent enchilada-eating contest, and a woman’s remarkable journey through evangelism and conversion therapy to accepting herself as she is. 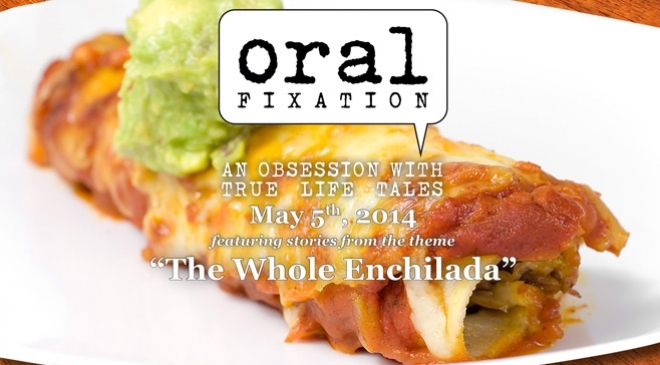 Oral Fixation is now accepting story submissions for “Lost in Translation,” a special Oral Fixation show at the Dallas Museum of Art on June 20. We are seeking only American immigrant voices. No writing or performing experience is necessary but stories must be true and on theme. For details and deadlines, visit the submissions page www.oralfixationshow.com. Season 4 dates and themes will be announced this summer. Follow us on Facebook and Twitter for updates! NOTE: Due to the overwhelming popularity of the series, Oral Fixation has moved to the larger Studio Theatre on Level 6 of the Wyly Theatre—just across the street from Hamon Hall. The date and time are still the same, Monday, May 5 at 8:00 p.m. In its new venue, the capacity will grow to 322. Don’t miss your last chance this season to join us for an evening of true life tales!